Senator Joseph A. Griffo named New Hartford’s James (Jimmy) Joseph recipient of the New York Senate Achievers’ Award, which recognizes individuals who overcome challenges and honors their accomplishments on behalf of their community. “There may be no ice available in Scotland at this time of the year,” said SLWCC Secretary David Morgan, “but we found, via the Internet, this tournament was taking place, and got ourselves an invitation." Read more here. Here's a report in the Hamiltom Advertiser. Team Canada athletes and coaches met in Edmonton last month to review the experience of the 2008 Worlds and to plan for the upcoming season. While the team's 6 consecutive victories during round robin play was enough to take them into the 1-2 playoff game, their failure to medal was a wake-up call. Program Director Gerry Peckham admitted that they had failed to anticipate the rapid improvements in technique exhibited by the medal teams, especially the Koreans. "The Koreans have established new benchmarks in accuracy, especially for up-weight shots, which were important on the exceptionally swingy ice in Switzerland," he said. "We will be working with specialists in biometrics to improve delivery mechanics. Also the rule change that will move the placement of the stone at delivery from the centerline to within 18 inches of the centre line (Rule to be published by the WCF in June) will change the way the game is played and we must prepare for that." The coaches will work with the five athletes who attended the Worlds, plus Jim Armstrong, who's present role will be mentor to the skip(s). Other members of last year's National Talent Pool will attend training sessions on an ad hoc basis, with everyone promised at least one more look before the 2010 squad is finalised later next season. Peckham also intends to arrange game practice against regular curlers who can provide the level of opposition expected at the next Worlds, and also promises to tighten practice procedures so they better reflect the skills necessary on the ice during international competition. "For practice to be meaningful, there must be a consequence for poor performance and poor decisions," he said. Team Canada's next training session will be in Edmonton in July. Wheelchair curling has arrived in Pittsburgh, Pa. with an afternoon of curling at the Robert Morris University Islnd Sports Complex. From the looks of the photos on the Pittsburgh CC website, they attracted some teens to try out our sport. The Ottawa Sun (April 14, 2008) had a photo and profile of Bruce Cameron. 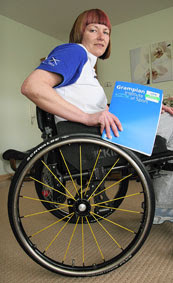 Bruce curled before his diagnosis with MS and now uses an electric wheelchair. 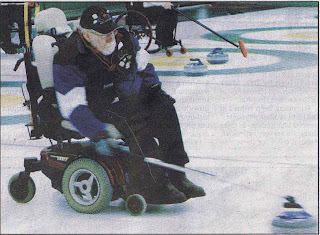 He curls out of the Capitol Curling Club and has won medals at Provincial wheelchair curling events. CLICK HERE to see the article. British Curling [thanks Bob] announced last July that there would be early selection of a small squad who would undergo two years of intensive preparation for the Vancouver games. The squad will be reduced to five in May 2009. Malone, a perennial at lead during Scotland's glory years, was dropped from the Scottish team that struggled in the 2008 Worlds, but then went on to skip the team that won the Scottish Championships. 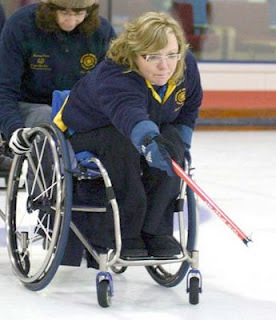 Scotland is notable for the number of females in the top tier of wheelchair curlers. Both teams in the final of the 2008 Scottish Championships were skipped by women.